Left: White Tannery Run 2 leather; Right: Prairie Gold Tannery Run 3 leather. See the leatherside of the White Tannery Run 2 and a size comparison with a 48" long ruler. See the underside of the Prairie Gold Tannery Run 3 and a size comparison with a soda can. This is tannery run goat leather. Tannery run is typically a mix of garment, #1, and high #2 grade leather. 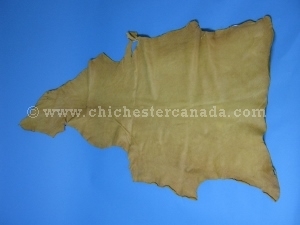 Goat leather is a good substitute for white deer leather. 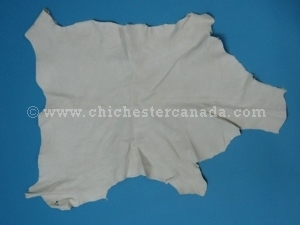 The tannery run 1 white goat hides are clean with good quality white throughout. Pieces are on average 8 sq. ft. There are few holes or imperfections. 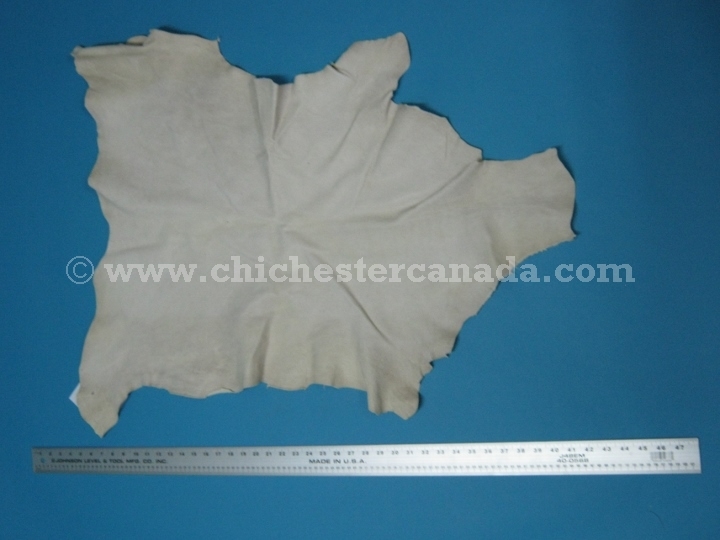 The tannery run 2 white goat hides have good suede sides for the most part but have extensive damage on the grain side (rubs, scratches, etc.). Pieces are on average 8 sq. ft. They have a few holes. 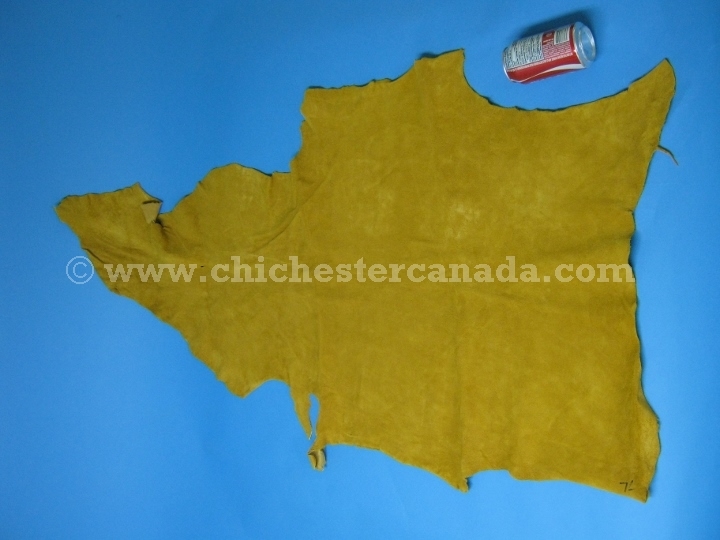 The tannery run 3 prairie gold goat hides have good suede and grain sides for the most part, and a few holes and imperfections on the whole. Pieces are on average 8 sq. ft.
CR-398-TR3-PG2 Goat Leather:Tannery Run 3:Prairie Gold:2.5 oz. C$3.50/sq. ft. C$2.50/sq. ft.
CR-398-TR1-WH2 Goat Leather:Tannery Run 1:White:2.5 oz. out of stock C$4.00/sq. ft. C$4.00/sq. ft.
CR-398-TR2-WH2 Goat Leather:Tannery Run 2:White:2.5 oz. out of stock C$3.50/sq. ft. C$2.50/sq. ft.